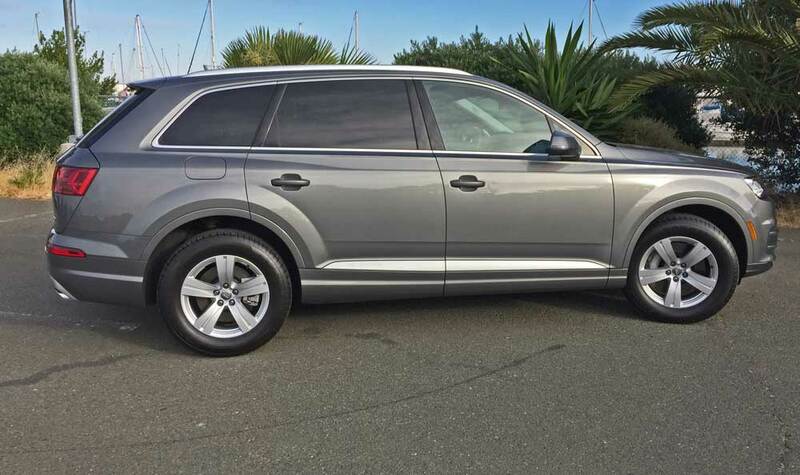 Audi’s Q7 has s been a premium luxury SUV from its inception, when the first generation bowed in 2007, but the latest Audi Q7 2.0T for 2018 ranks at the top of its class ladder, leaving similarly outfitted competitors in its wake. 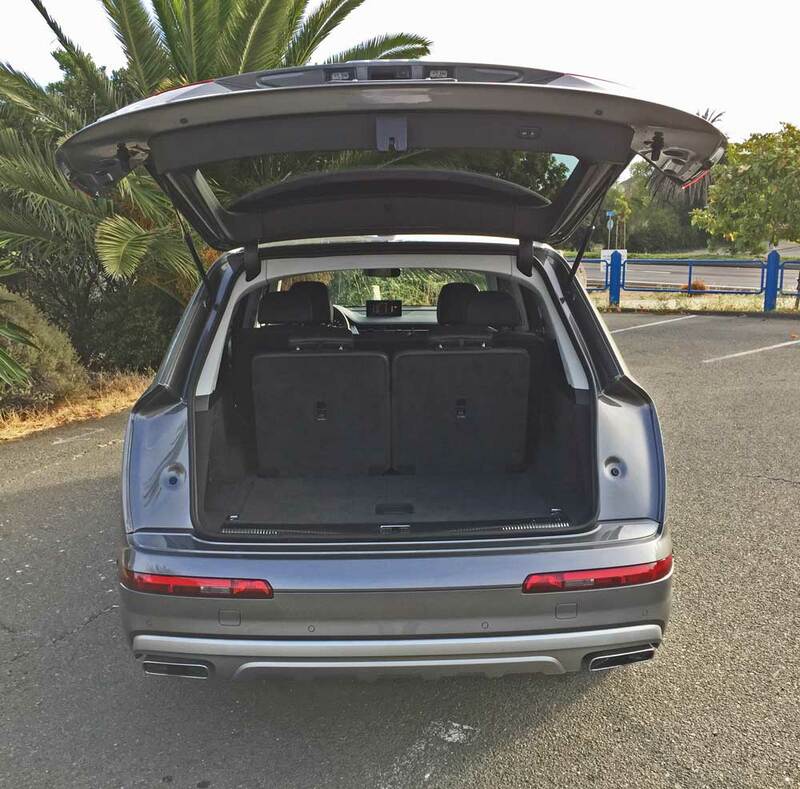 With three rows of seating and weighing in at just over two and a half tons (4,776 pounds to be more precise), one might probably jump to the conclusion that the Q7 is simply a pricey people hauler lacking in performance attributes like the majority of its competition. Not so my friends, since the Q7 has shed a significant of weight from that of its predecessor and is capable of moving from 0-60 mph 7 seconds, and can reach a top speed of 130 mph, which is electronically limited. The Q7 is based on the Volkswagen Group’s MLB II platform and is light, thanks in part to the high-strength steel construction and the extensive use of aluminum for body panels and in the revised front and rear multilink suspension, as well as with the standard eight-speed automatic gearbox integrating the quattro all-wheel-drive system’s transfer case. Motive force comes from a healthy, longitudinally mounted 2.0-liter, TFSI, DOHC, 16-valve turbocharged and intercooled four-cylinder engine. 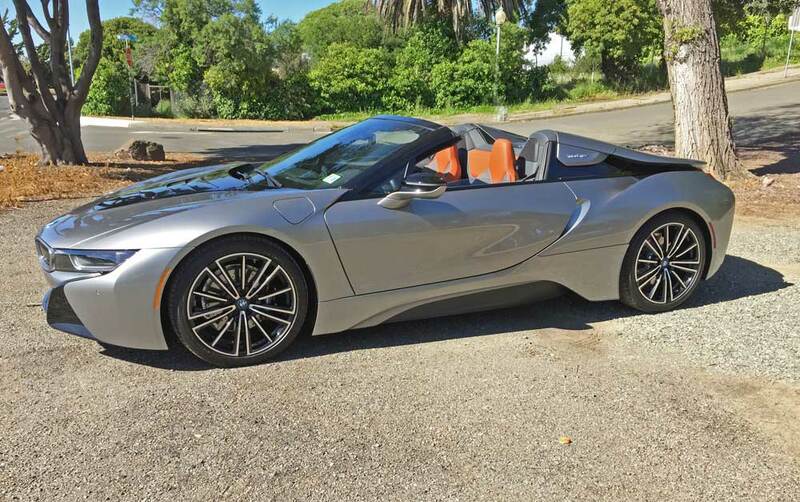 The horsepower rating is 252 at 6,000 rpm, and the pound feet of torque generated amounts to 273 at 1,600 rpm. 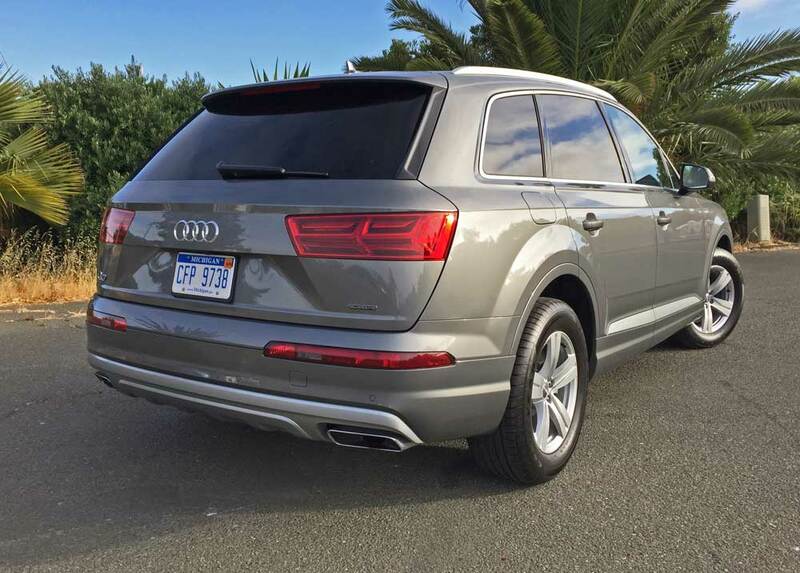 The 2.0T Q7’s towing capacity is 4,400 pounds. The fuel capacity is 22.5 gallons and the EPA mileage estimates are 19-mpg city / 25-mpg highway. There’s also a 3.0-liter gas powered version available for an extra $6,500 with a higher towing capacity. The 2.0T can tow up to 4,400 pounds, while the 3.0T is capable of towing up to 7,700 pounds. 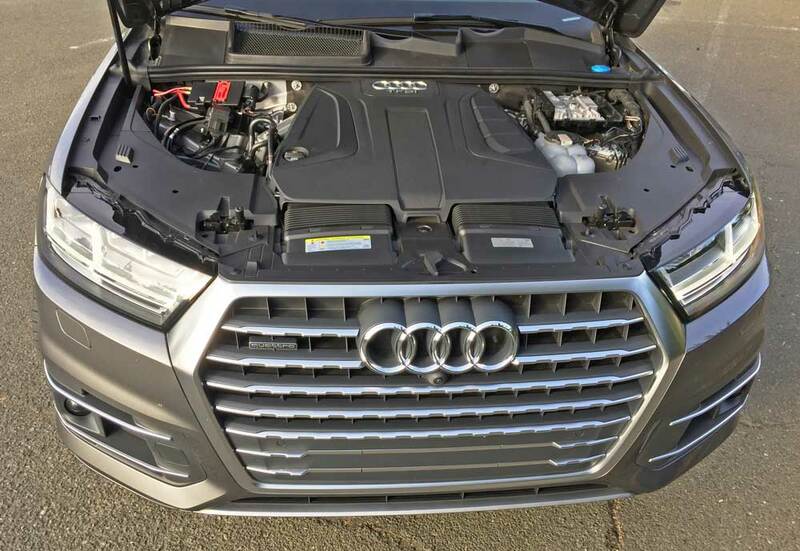 The engine’s energy reaches the quattro all-wheel-drive system with a hypoid gear and electronic locking front differential, torque sensing center differential and hypoid gear rear differential, also with electronic locking (EDL) and Torque Vectoring through a Tiptronic® eight-speed automatic transmission with Dynamic Shift Program and steering wheel mounted paddle shifters. Suspension componentry consists of a Five-link independent setup with steel springs and optional 4-corner adjustable air suspension with multiple settings up front and is also a Five-link independent arrangement with steel springs and optional adjustable air suspension in the rear. 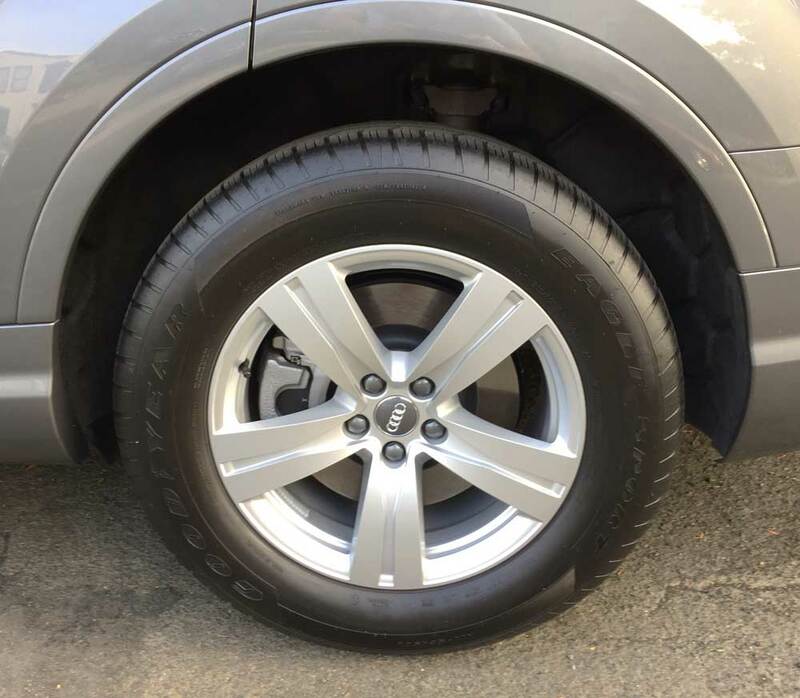 The Q7 2.0T rolls on Goodyear Eagle Sport 255/60 R18 108H All-Season tires mounted on 5- grooved spoke alloy wheels. Braking duties are managed by power-assisted four wheel ventilated discs all around with ABS, EBD, ESP and a tandem brake booster. The exterior dimensions of the 2018 Audi Q7 2.0T are slightly less overall than its than the first generation Q7, except for height where is has gained one tenth of an inch. 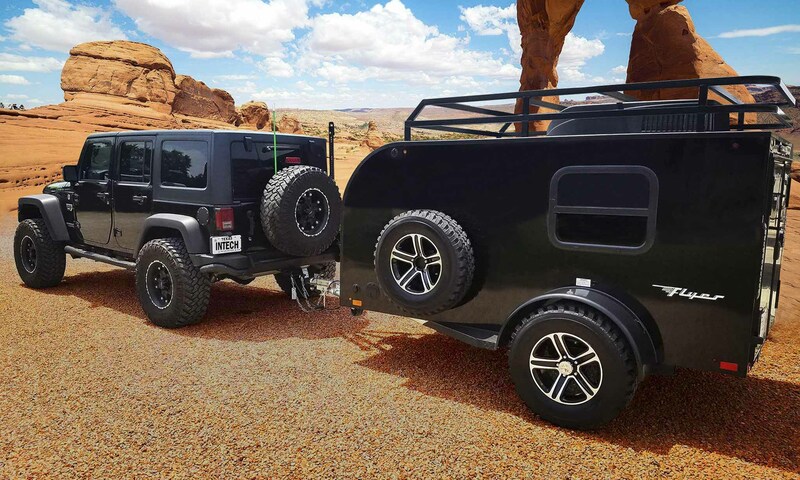 The wheelbase is now 117.9-inches, the overall length 199.6-inches, width measures 77.5-inches with mirrors, and the height is 68.5-inches unladen. The drag coefficient is 0.32. It is still a big vehicle, but somehow manages to come across as more wagon-like in both its appearance and handling characteristics. Visually, the newest Q7 Audi’s exterior exhibits, the bold, Q model 3D Singleframe design trapezoidal grille up front, flanked by the latest in adaptive LED headlights, capable of flooding the road ahead with a bright white light. In profile, the Q7 displays an extended coupe-like persona with its blacked out “B” and “C” pillars and bright glass area surround trim. A strong character line runs around the entire vehicle from headlight to headlight, and wheel wells sport pronounced arches front and rear. The tail end wraps up with wraparound LED tallamps with a double arrow design and a lower character line. The rear diffuser showcases integrated twin- exhaust outlets and wide wraparound marker lights that emphasize the Q7’s broad stance. The roof contains a large standard two panel panoramic sunroof and finishes with an integrated rear roof spoiler. There are three levels of trim: Premium; Premium Plus; and the ultimate Prestige. The cabin or interior is a virtual living room full of technological marvels and luxurious appointments. Adding to comfort, convenience and connectivity are: Audi Drive Select with up to seven modes; Audi Virtual Cockpit; available full color HUD; MMI all-in-touch; available 4G LTE in car Connect care and Connect Prime infotainment, security and service features; available Bang & Olufsen 3D Advanced Sound System or a Bose 3D Sound System; standard 3-zone and available 4-zone climate control system. 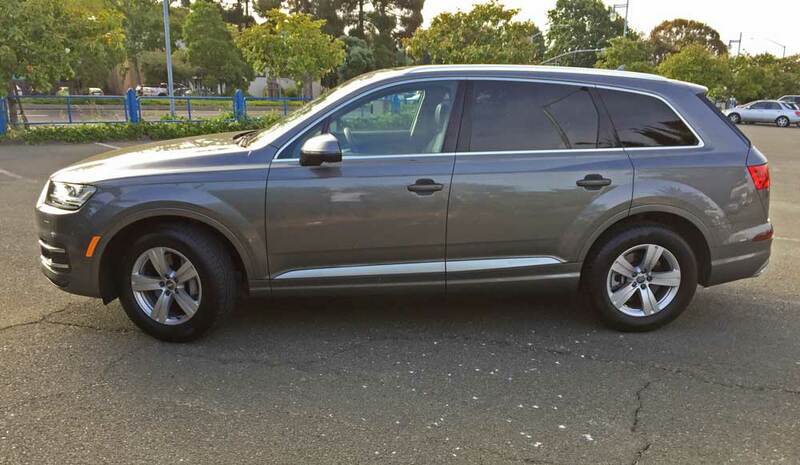 My test 2018 Audi Q7 3.0T quattro Tiptronic SUV came in Premium Plus trim and wore an exterior finish of Graphite Gray metallic and featured an interior executed Black, with satin metal trim accents. The Base price was set at $49,900. Options and extras increased the final total to $62,100. 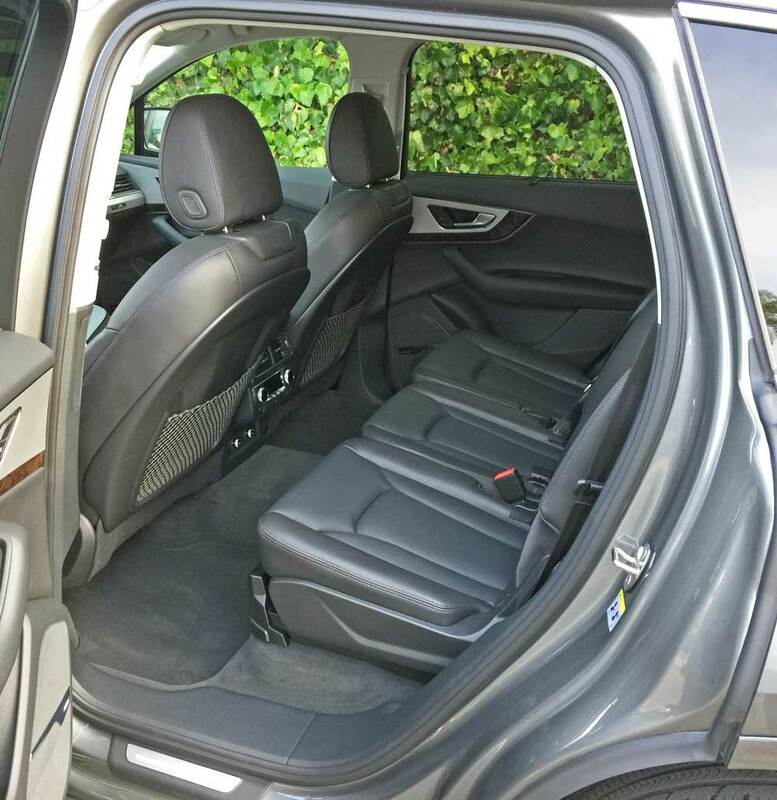 Optional costs included: the metallic paint; the Premium Plus Package; Driver Assistance Package; Vision Package; Warm Weather Package; Cold Weather Package; and the Destination Charge. 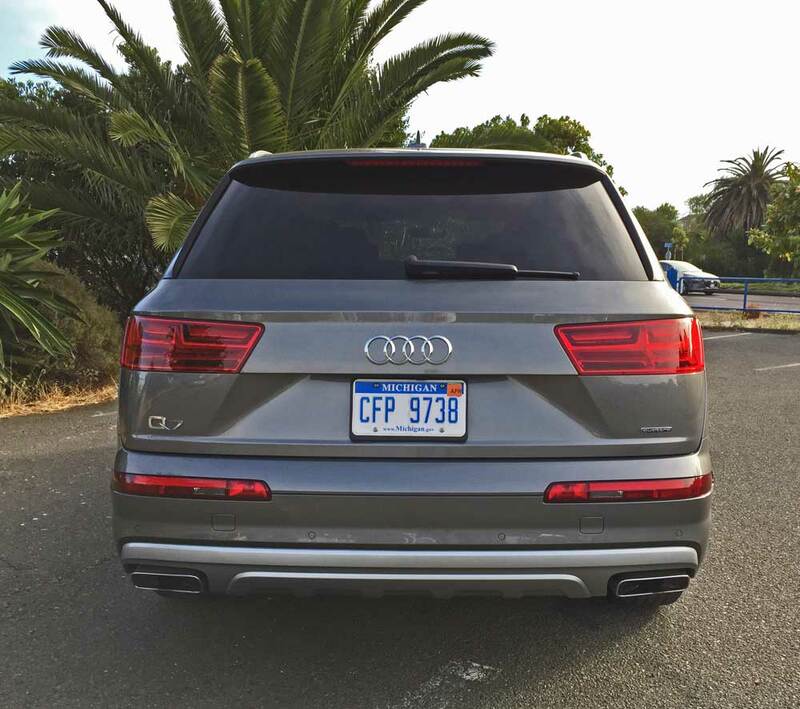 As already suggested, piloting this latest iteration Audi Q7 2.0T is more akin to driving a premium luxury sport sedan. This impression relates to its impressive agility in spite of its bulk. Handling characteristics showcase minimal body pitch or roll during more spirited maneuvers. thanks to the quattro all-wheel drive system and Audi Drive Select with customizable performance levels. Acceleration is more than satisfactory given the vehicle’s displacement of the atmosphere. 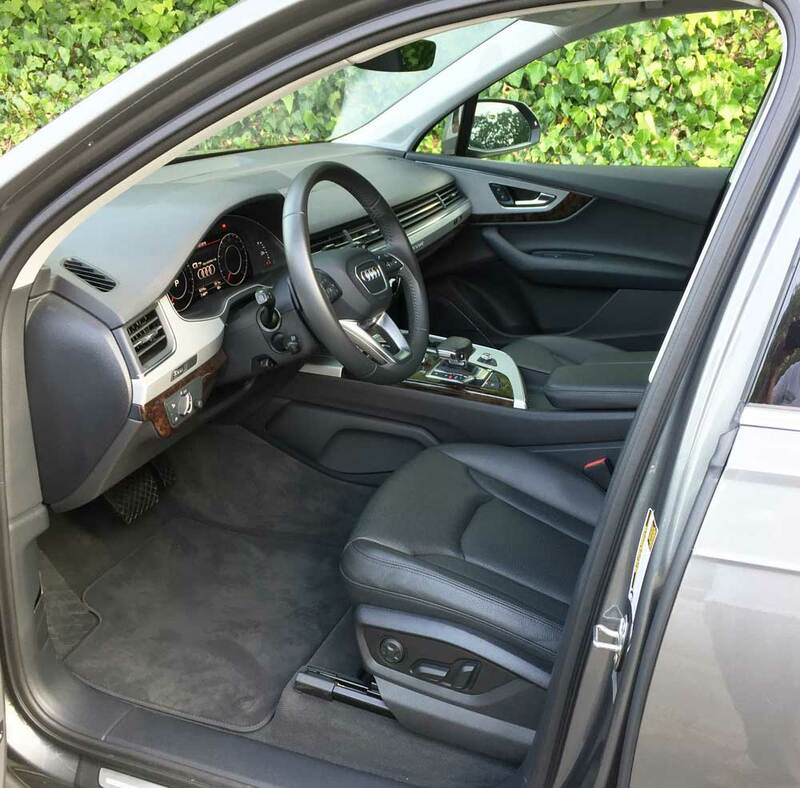 The ride comfort level is outstanding and the interior ambience is sumptuous and luxurious. The level and content of convenience features all contribute to a delightful travel experience. 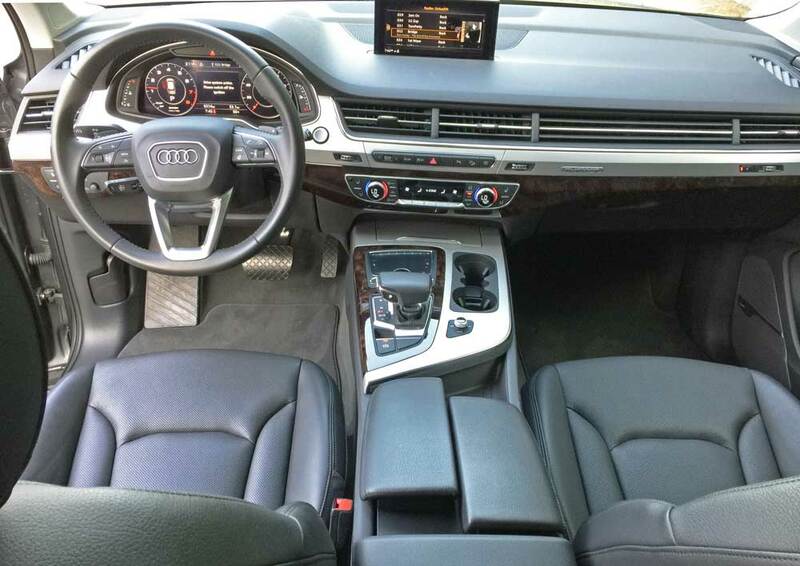 The Q7 is capable of performing some of the dynamic exercises via its innovative and instinctive adaptive cruise control that teams with the navigation system and Google Maps initiating braking and acceleration through approaching curves while even adding non-intrusive steering inputs. Switching from the Dynamic to the Auto or Comfort mode tones down performance levels to a more relaxed state for extended road trips. Visibility is good all around with the low cowl and hood and thin “A” and “B:” pillars. Steering is on center and instantly responsive. The second row folding seating is in a 40/20/40 configuration and the dual 40/40 third row seats are power folding, but on the snug side for any but small adults. There are two off-road modes for assistance in modest off road excursions allowing for raising the ground clearance to 9.6-inches, but remember, the Q7 has no low range transfer case, so rock crawling is not an option. Audi has succeeded in making this large SUV visually appealing, and it fits well into the balance of their vehicle offerings, with a heightened level of luxury throughout, as well as the pleasing agility. Yes, the price tag is on the high side of the equation, but it definitely seems well worth it. Engine Type and Size: 2.0T TFSI, DOHC, 16-valve turbocharged and intercooled inline four-cylinder with direct injection. Transmission: 8-speed Tiptronic with manual shifting mode and paddle shifters. Drive Train: Longitudinally front mounted engine / quattro permanent all-wheel-drive system with hypoid gear with electronic locking front differential, torque sensing center differential and hypoid gear rear differential with electronic locking. Suspension: Front – Five-link independent with steel springs and optional 4-corner adjustable air suspension with five settings. Rear – Five-link independent with steel springs and optional adjustable air suspension. Brakes: Power-assisted four wheel ventilated discs with ABS, EBD, ESP and tandem brake booster. Tires: Goodyear Eagle Sport 255/60 R18 108H all-season mounted on 5-grooved-spoke alloy wheels.